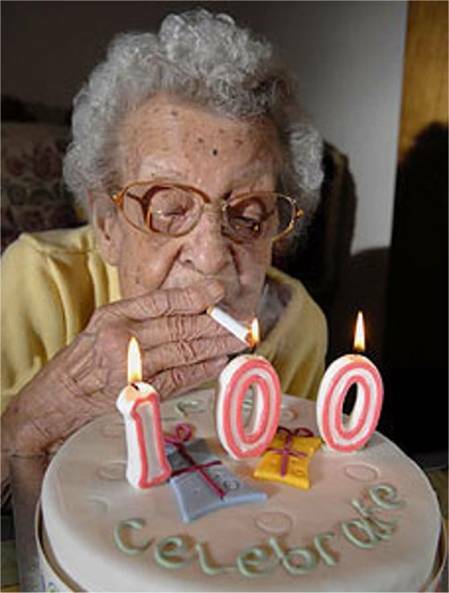 Jay's Smokers Rights Blog: Never believed smokers can live for as long as 100 years? Never believed smokers can live for as long as 100 years? This is a special pic for any antismokers lurking on here. I've actually seen this pic (prior to today) of a smoker using a candle on her birthday cake to light her cig. But I bet not too many antis have seen this one before! Based on modern antismoking logic, it's impossible for a smoker to live for 100 years. The reality is, it IS possible for a smoker to live for 100 years. If a smoker eats healthy food, and exercises regularly, that smoker will live longa than a nonsmoker. I don't have a URL to confirm that as a fact. But I heard it on CBS News in the 90's. The reporter said smokers who exercise live longa than nonsmokers who exercise. And smokers who have healthy diets can also play a factor in how long he/she lives. Oh yeah. Did I say once most of the smokers who live for at least 100 years are cigar smokers and smokers who make their own cigs?